VANCOUVER, B.C. – September 2, 2015 – Metro Vancouver* home buyers spent the summer months searching for their next home. Between June and August, home sales were between 25 and 30 percent above the ten-year sales average. The Real Estate Board of Greater Vancouver (REBGV) reports that residential property sales in Metro Vancouver reached 3,362 on the Multiple Listing Service® (MLS®) in August 2015. This represents a 21.3 percent increase compared to the 2,771 sales recorded in August 2014, and a decrease of 15.5 percent compared to the 3,978 sales in July 2015. Last month’s sales were 27.9 percent above the 10-year sales average for the month. New listings for detached, attached and apartment properties in Metro Vancouver totalled 4,281 in August. This represents an 8.7 percent increase compared to the 3,940 new listings reported in August 2014. The total number of properties currently listed for sale on the region’s MLS® is 10,897, a 26.2 percent decline compared to August 2014 and a 5.3 percent decline compared to July 2015. The MLS® Home Price Index composite benchmark price for all residential properties in Metro Vancouver is currently $708,500. This represents a 12 percent increase compared to August 2014. The sales-to-active-listings ratio in August was 30.9 percent. This is the sixth consecutive month that this ratio has been above 30 percent in Metro Vancouver. Sales of detached properties in August 2015 reached 1,290, an increase of 11.4 percent from the 1,158 detached sales recorded in August 2014, and a 22.6 percent increase from the 1,052 units sold in August 2013. The benchmark price for a detached property in Metro Vancouver increased 17.5 percent from August 2014 to $1,159,600. Sales of apartment properties reached 1,494 in August 2015, an increase of 32.7 percent compared to the 1,126 sales in August 2014, and an increase of 46.8 percent compared to the 1,018 sales in August 2013. The benchmark price of an apartment property increased 6.3 percent from August 2014 to $405,400. Attached property sales in August 2015 totalled 578, an increase of 18.7 percent compared to the 487 sales in August 2014, and a 30.2 percent increase from the 444 attached properties sold in August 2013. The benchmark price of an attached unit increased 7.3 percent between August 2014 and 2015 to $511,500. 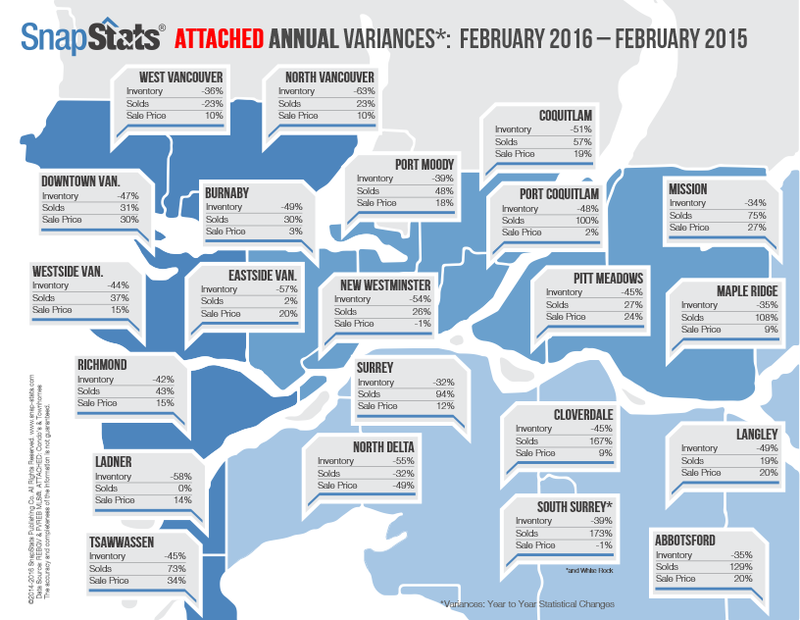 Are you wondering about price trends in other areas of Vancouver real estate? Maybe you're thinking of moving to a condo in Lower Lonsdale or a house in Grandview/Commercial Drive, or you're just curious. 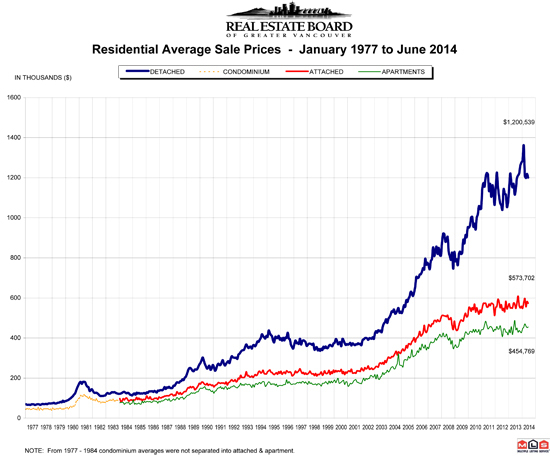 I'm happy to send you my 5 Year Price Trend Report for all areas of Vancouver real estate - no obligation of course! The Real Estate Board of Greater Vancouver (REBGV) reports that residential property sales in Greater Vancouver reached 3,406 on the Multiple Listing Service® (MLS®) in June 2014. This represents a 28.9 percent increase compared to the 2,642 sales recorded in June 2013, and a 3.7 percent increase compared to the 3,286 sales in May 2014. Last month’s sales were 0.6 percent above the 10-year sales average for June of 3,386. The sales-to-active-listings ratio currently sits at 21.3 percent in Greater Vancouver, which is the highest this measure has been since June 2011. The MLS® Home Price Index composite benchmark price for all residential properties in Metro Vancouver is currently $628,200. This represents a 4.4 percent increase compared to June 2013. New listings for detached, attached and apartment properties in Greater Vancouver totalled 5,339 in June. This represents a 9.5 percent increase compared to the 4,874 new listings in June 2013 and a 10.1 percent decline from the 5,936 new listings in May. Last month’s new listing count was 2.6 percent below the region’s 10-year new listing average for the month. The total number of properties currently listed for sale on the MLS® system in Greater Vancouver is 16,011, a 7.4 percent decline compared to June 2013 and a 0.4 percent decrease compared to May 2014. Sales of detached properties in June 2014 reached 1,462, an increase of 32.7 percent from the 1,102 detached sales recorded in June 2013, and a 58.7 percent increase from the 921 units sold in June 2012. The benchmark price for detached properties increased 6.2 percent from June 2013 to $976,700. Sales of apartment properties reached 1,308 in June 2014, an increase of 22.5 percent compared to the 1,068 sales in June 2013, and a 27.5 percent increase compared to the 1,026 sales in June 2012. The benchmark price of an apartment property increased 2.4 percent from June 2013 to $378,000. Attached property sales in June 2014 totalled 636, a 34.7 percent increase compared to the 472 sales in June 2013, and a 53.3 percent increase over the 415 attached properties sold in June 2012. 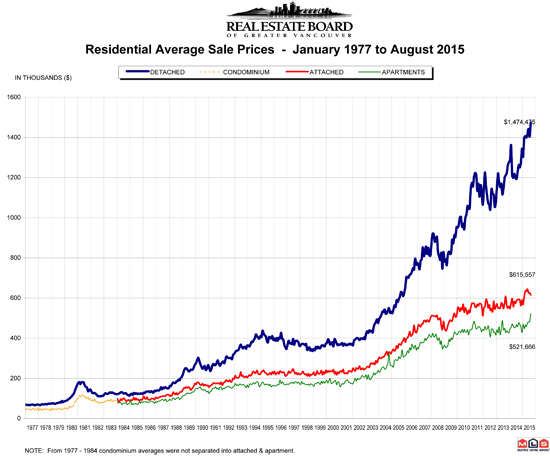 The benchmark price of an attached unit increased 3.1 percent between June 2013 and 2014 to $471,200. VANCOUVER, B.C. – May 2, 2014 – Home buyers and sellers became more active in the housing market in April. The Real Estate Board of Greater Vancouver (REBGV) reports that residential property sales in Greater Vancouver reached 3,050 on MLS® in April 2014. This represents a 16.1 percent increase compared to the 2,627 sales recorded in April 2013, and a 15.5 percent increase compared to the 2,641 sales in March 2014.
a wee bit about 2013 real estate in Vancouver, more details available. Vancouver real estate in 2013 is best described as a 'balanced market' - in other words, a healthy market not favouring buyers or sellers. We had several years of a market favouring sellers (competing offers were pretty much the norm not the exception!) then it shifted a bit toward buyers and has now settled into a balanced position. For complete details and statistics on number of sales and Vancouver real estate price changes please go to my 'resources' tab and drop down menu: Market Report.